There are many myths, stories, and misunderstandings surrounding Ozark bluff shelters. These interesting and unusual geologic features have attracted people’s attention for literally thousands of years, so it’s natural that stories surrounding these locations exist. While a good story can be fun, even if it isn’t true, there are consequences to these myths because they often lead to the destruction of what is interesting, rare, and valuable about these sites—the information they contain about the prehistoric past and the Native Americans who lived there. Here are a few examples of bluff shelter myths that archeologists know are not true. 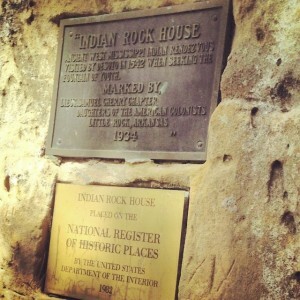 Historic Plaques at Edgemont Shelter (AKA Indian Rock House Cave) in Van Buren County. One placed there in 1934 claiming that DeSoto visited the site (he did not), the second (1982) recognizing its placement on the National Register of Historic Place (for its rock art). There is no naturally occurring gold or silver in the Ozarks. The geology is all wrong for either to occur here naturally, yet people still tell stories of gold and silver and search for it in bluff shelters. This often destroys archeological deposits as people dig through the shelters trying to find something that is not there. Stories of gold and silver were in circulation in the late 19th and early 20th centuries and inspired many mining claims in the region. None of these claims panned out. Although many minerals, like lead and zinc, have been mined in the region, silver and gold have never been mined in the Ozarks. Treasure stories have been popularized in print both as entertainment and sometimes as fact, but archeologists, historians, and geologists all agree that these accounts are purely fiction. The gold or silver was never here, and it has been searched for for a century without success, in the process destroying something that was of great value—information about the past. The stories center around gold hidden by either early explorers such as Hernando de Soto or lost mines of early Spanish settlers. There is no evidence that the Soto expedition visited the heart of the Ozarks. They only got as close as Batesville in the east and the Arkansas River Valley near Fort Smith in the west. Archeologists and historians know this because of first-hand accounts written by some of Soto’s men. The archeology backs up these accounts. However, these shelters are no less interesting as sites because of this. After all, their history extends back almost 10,000 years. Stories of giants found in prehistoric North America are common, and the Ozarks has its own version of this myth. There are accounts and newspaper stories of prehistoric giants being unearthed in various places in the Ozarks. The roots of these stories are in the late-nineteenth and early-twentieth centuries—the same time that stories began circulating about buried gold in the region. There is however no evidence of this, despite continued repetition of the story by television programs and internet sources. No reputable professional archeologist has found evidence of extremely tall prehistoric skeletons in the Ozarks in the past. Bioarcheologists have studied thousands of skeletons from prehistoric Arkansas that have been excavated over the past century, and many have been recently reevaluated as a part our compliance with the Native American Graves Protection and Repatriation Act. We have no evidence for prehistoric giants in Arkansas. Buried human remains are found in bluff shelters. In some cases a burial can look quite tall when excavated because more space exists between the bones than would be the case in a living person. This means that a skeleton can appear to be quite tall when laid out. You cannot simply measure a skeleton in the ground and determine the height of the individual. Bioarcheologists calculate height by using the length of leg bones and a formula for finding height based on thousands of known examples from army records. They compared height in life to the length of the bones of the leg in thousands of known cases and can now accurately predict how tall someone was in life based on measuring long bones. A fairly naturalistic pictograph of a fiddlehead fern from Petit Jean Mountain. While nineteenth and early-twentieth century accounts of rock art in the Ozarks sometimes refer to “hieroglyphics” or “picture writing,” the markings in caves and shelters are in fact not writing but art. 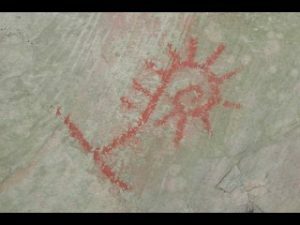 No Indigenous written language existed in North America prior to European contact, so the prehistoric Native Americans who made these marks could not have been writing. Additionally, despite some interpretations there is no evidence that ancient European explorers left messages in ogham, Norse runes, Greek, Phoenician, or any other language on the walls of bluff faces or in shelters or caves in the Ozarks. The rock art left behind by Native Americans, however, does have symbolic elements, but this is different than written language. In some cases the art seems to use images that evoke a story or a set of ideas, but the images do not directly correspond to words the way written language does. We use symbols in similar ways everyday. For example, a dove might evoke the idea of peace in modern American symbolism and a cross conveys an entire set of religious beliefs. Some rock art depicts naturalistic images from every day life, like this pictograph of a fiddlehead fern from Petit Jean Mountain or the paddlefish and fish trap pictographs from Rock House Cave. Other examples are more abstract or geometric. Still other examples, especially north of the Arkansas River and in small isolated shelters, have been interpreted as connected to the prehistoric ritual life of Native Americans. Dr. Sabo’s interpretation of the human figures at The Narrows as a depiction of a dance honoring a Native American creation myth is one such example.